Aaron Scott Design creates one-of-a-kind as well as commissioned works of functional design including furniture, lighting, and architectural installations. Rooted in art and disciplined by engineering, works by Aaron Scott Design are hand-crafted with mathematical rigor, operating in the interstices of art and design. His furniture explores the relationship between objects and perception, and is informed by his work in conceptual art and filmmaking. He regards his design works as explorations in spatial and temporal concepts. From his childhood in the forests and mountains of the Pacific Northwest, Aaron Scott has been influenced by the formal complexities found in nature – skeletal systems, plant forms, topography and cellular structure; he has also had a lifelong interest in mathematics, including structural engineering, non-euclidean geometries, rotational symmetries, topology and tensile structures. He approaches each piece as a unique experiment in spatial dynamics. Aaron Scott was born in 1974 in Southwest Oregon. He studied philosophy at the University of Colorado at Boulder, followed by graduate work in fine art and filmmaking at San Francisco Art Institute. He moved to New York City in 1998 to make art and films. His design practice began when he started making functional objects for friends, artists and galleries, which led to commissions for furniture and lighting. He continues to reside and work in New York City, with simultaneous practices in art and design. 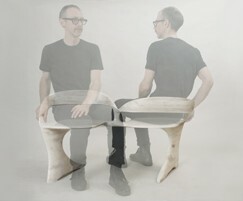 Aaron Scott’s furniture and design work has been exhibited at Voos Showroom, Brian Kish Gallery, 208 Gallery, ICFF, Wanted Design, Architectural Digest Home Design Show, IMM and Dwell on Design. His lighting has been featured in Furniture Fashion and Design Duct, Light Magazine, DARC Magazine, Quintessence Blog, Best Interior Designers and the Washington Post. His film and performative work has been exhibited at Anthology Film Archives, Dixon Place, Abrons Arts Center and Valentina Angeloni Gallery.Aaron Scott’s furniture & lighting can be found at Design Lush in the US and P-Concept in Switzerland. He recently showed drawings and sculpture at Este Gallery in Brooklyn, NY.